EagleVail’s Mikaela Shiffrin stretched her record for wins in a single World Cup season to 16 on Saturday with a razor-thin .07-second victory over Switzerland’s Wendy Holdener in the World Cup Finals at Soldeu, Andorra. “It was just a really amazing day to be racing,” Shiffrin told the Associated Press. Shiffrin trailed Holdener by .28 seconds after the first run but then turned on the jets in the second run with the fastest time and her record-tying eighth slalom win of the season. For Holdener, who has the bad luck of racing during Shiffrin’s dominant era, it was the Swiss skier’s record 22nd podium (top 3) finish in slalom without a win. The victory also marked Shiffrin’s 59th career win, just three behind retired Austrain great Annemarie Moser-Proell’s 62 on the all-time women’s victory list. Moser-Proell is second on that list behind only recently-retired Lindsey Vonn of Vail’s 82 career wins. Shiffrin can stretch her season victory mark to 17 Sunday in the giant slalom, in which she needs just 14 points to clinch her fourth discipline crystal globe this season. Shiffrin has already secured the ladies’ slalom crystal globe, her sixth in this discipline. She joined Ingemar Stenmark (8), Vreni Schneider (6) and Marcel Hirscher (6, incl. 2019) on at least six wins in the slalom classification. Shiffrin equaled Stenmark on an all-time record list of 40 World Cup slalom race victories. 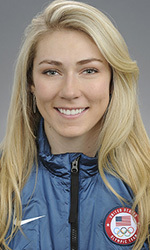 Shiffrin became the third alpine skier to win at least 40 World Cup races in a single event, after Stenmark (46 in giant slalom, 40 in slalom) and Vail’s Lindsey Vonn (43 in downhill). The last 20 ladies’ World Cup slalom races were either won by Shiffrin (15) or Petra Vlhová (4). Frida Hansdotter was the last skier other than Shiffrin or Vlhová to win a ladies’ slalom race as she won in Flachau on 10 January 2017. Shiffrin (8) became the second skier, male or female, to win eight World Cup slalom races in a single season. Janica Kostelic set the all-time record of eight in 2000/01. Shiffrin has recorded a top-three finish in 21 of the last 22 World Cup slalom races, including in each of the last 11, with the only exception a DNF in Lenzerheide on 28 January, 2018. Shiffrin became the fourth woman to record 11 successive slalom podiums in the World Cup, after Erika Hess (13), Kostelic (11) and Schneider (11). With Shiffrin’s fourth place in Thursday’s super-G and win in Saturday’s slalom, she now has 2,104 points, with one race to go – surpassing Hermann Maier, who scored 2,000 points (and holds the men’s record) in the 1999-2000 season. From 2000-2013, he also held the title of most points in one season, until Tina Maze scored 2,414 points in the 2013 season. Shiffrin will be the first to admit this wasn’t a goal of hers, and Maze also gave some advice to Shiffrin against going for this goal, to save her sanity. Former teammate Vonn came close to 2000 points in 2012, when she scored 1,980 points. Shiffrin needs just 14 points in the final race of the season on Sunday, the giant slalom, to secure the season-long GS crystal globe and her fourth globe of the season to go along with her third straight overall globe, the super-G and the slalom.